Nothing says Independence Day holidays (4th of July) like a day at the beach. If it is summer where you are, no doubt you have been to the beach or are planning to go. Today, I will share the best items to have in your beach tote, whether you are a parent taking the kiddos or just yourself. The beach can be a sandy or grassy area, near a body of water whether it is a lake, a river, the bay, or the ocean. I grew up on the beaches of San Diego, spent some beach time next to lakes and rivers in Yosemite, and now along the beaches of the delta. Let’s start with the right bag. Pictured here is one I use. I bought this through Home Shopping Network (HSN) through the lady who sells the huggable hangers, Joy Mangano. This is not an endorsement, but many of her products are inventive, useful and very practical. This bag has it all. It is a good size with comfortable handles for hands or shoulders. It also has two side pockets large enough for water bottles or sunscreen. Inside is another deep, interior zippered pocket. This bag is unique in that it also has an insulated zippered section to store cold items (use your own freezer pack or ice). If you hate sand as much as I do, this bag even has a solution for that. The bottom has a zippered pocket with a mesh top. Unzip, sand falls out, everything else stays in. Store your sandy flip-flops or swim suit in this spot, too. Genius! You can also purchase these through Amazon. My mom used to pack our beach gear in brown paper bags. I felt silly hauling those things from the car to the sand. I swore I would never use grocery bags, although I have used the re-usable canvas bags on occasion. Because of that childhood memory, I consider myself the Queen of Tote Bags. I have a few. Guys, if you are reading this, a backpack will work for you. Dakine (shown here) makes the perfect sturdy backpack with lots of pockets. A large back pocket can even hold your wet clothes or even an entire wet suit! I have used this, too. Now that we have the tote, what goes in it? Rentals—at many beaches, you can rent equipment like life jackets, boards, chairs, umbrellas, etc. These same tips can be applied if you have your partner with you. In my case, I add an ice chest with water, beer, snacks, and a bottle opener for hubby. He really needs that ice-cold beer after a session of windsurfing. Most public beaches do not allow alcohol or beverages in glass containers, so check the beach rules before you go. Safety warning! If you drive and intend to leave valuables in your vehicle, try to store them in the trunk or out of sight BEFORE you park in the lot or on the street. Do not put your purse or valuables in the trunk while parked. Thieves wait for these opportunities to break into cars once they watch someone doing this! This post was inspired by a couple of blogs I have read lately. 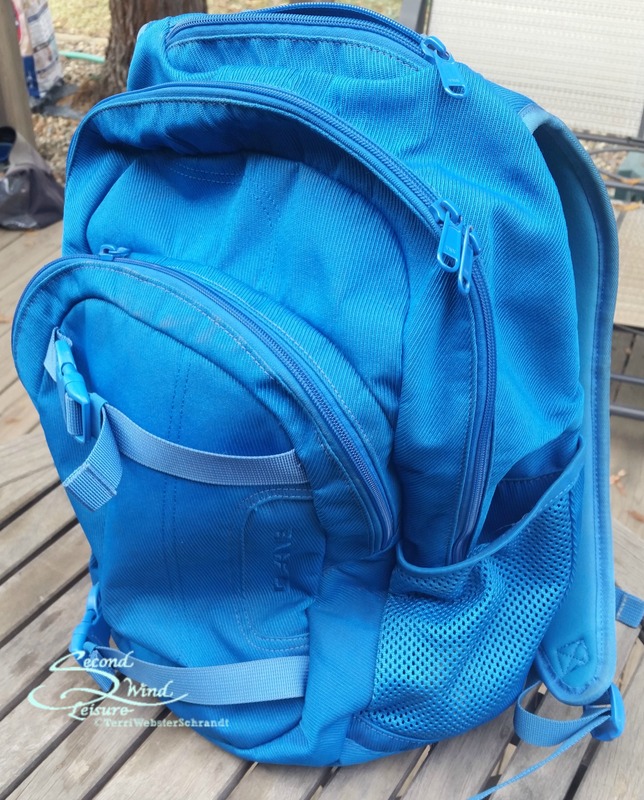 One by Debbie In shape, titled, “What’s In my Gym Bag.” Another, “What’s in My Blog Bag” was posted by another blogger. 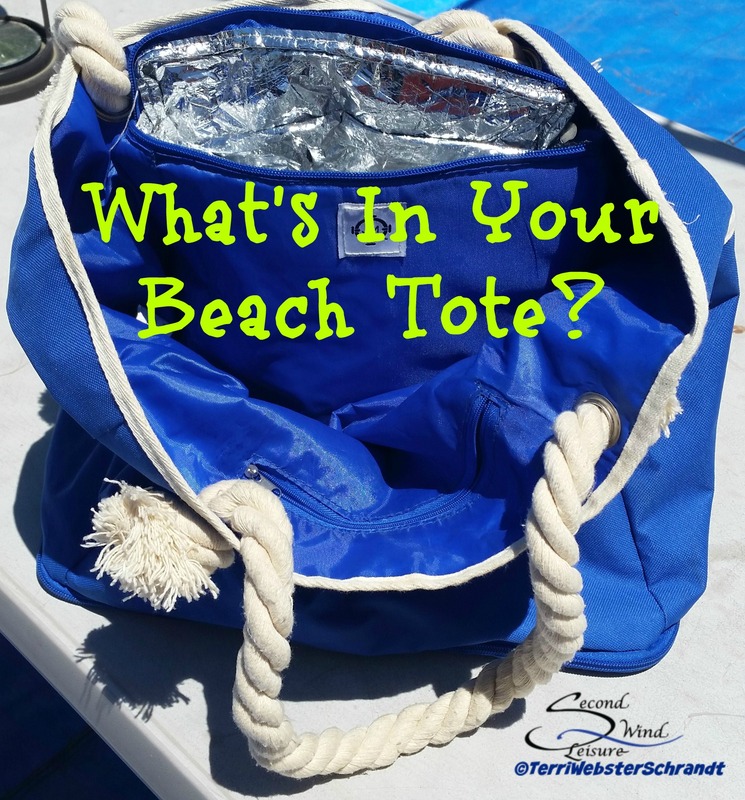 What is in YOUR Beach tote? This is a great list! Finding the right bag is key, plus who doesn’t love shopping?!? I wouldn’t have thought to bring lip balm with SPF so that is a great reminder! Thanks for joining the Link-It To Me Link Party, I hope you will party with us again this week! Great comprehensive list for a great day at the beach. Thank you for sharing with us at #WednesdaysWisdom and look forward to your post next week. Wow! Thank you so much the mention, Terri. It is really appreciated. I have a tote I leave at my mom’s that I use when we go to the beach. Sunscreen, sunglasses and towels are must have. Generally my mom stays with the wallets because she does not go much in the water. It is such a pleasure to have you at #TipTuesday! I know what’s going to be in my bag next time I go, this really cool ground cover from geckoactive.com. I can’t wait to post a review soon. It’s huge! And, sunscreen. That is a must for me. The stronger, the better. Thanks for sharing your post at the #AnythingGoes Link Party. That sounds like a great idea! Thanks for hosting the link up. I haven’t used this trick in a while, but talcum powder helps remove sand from your feet! That sounds like something worth trying! Thanks for sharing! A checklist is actually very helpful! It’s the worst to get to the beach and realize that you forgot something important. Thanks for adding this to the #funsummerfinds linkup! Thank you, Shellie! How did you like that bag? I loved the idea of the vented bottom! I always throw in a couple of big zip lock baggies, and a smaller one for my phone. You never know when you have wet stuff! Good one! I do too! Your memories of the grocery bags brought back beach memories of my own. My parents weren’t much in the way of beach lovers but when we did go, they’d pack as if we were eating at home! It wasn’t too convenient I think however I do remember the food we’d bring…Good ol’ Italian-American food consisting of peppers and eggs omelette on Italian bread or else potatoes and eggs omelette sandwiches! These style sandwiches were ubiquitous in Italian-American beach picnics! I’m drooling thinking of it now! Have a superrrr July 4th weekend, my dear!!! Our grocery bags were not full of food, alas. Your family sounds like it went to the beaches in style with all that yummy food! Hope your July 4th weekend is full of fun…perhaps you’ll see some great NYC fireworks shows! Thanks, Terri! I’ll actually be out of the city for the weekend with friends just north of NYC…looking forward though to some R&R and to celebrate the USA! All excellent tips. The bag will the mesh bottom is the best invention in bags I’ve ever seen! I know…sure wish i had thought of it 😉 And thank you!